Because our location is on Veterans Hwy. just south of Old Mill Rd. and near I-97, Extra Space Storage is easily accessible to residents of Millersville and surrounding areas like Severna Park and Glen Burnie. 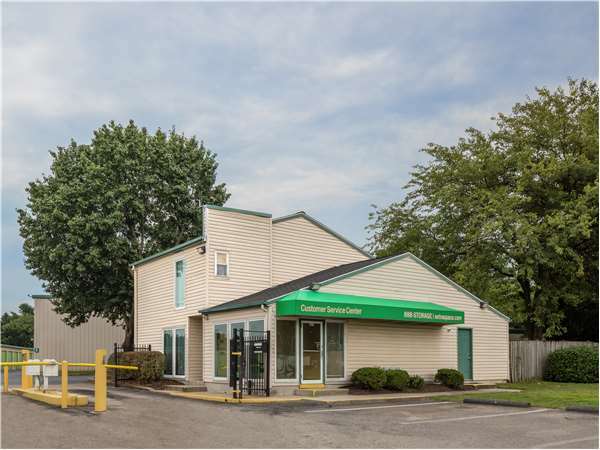 With several residential areas surrounding our facility—including Windy Knolls, Zeman, and Chartwell—and several apartment complexes nearby—including The Elms at Old Mill, Yorktowne Apartments, and Berkshires at Harpers Mill—we're the convenient self storage option near you! We have a wide range of storage units with indoor and drive-up access, climate-controlled storage, and even storage units capable of storing vehicles—we're your Millersville storage solution! Extra Space Storage in Millersville has storage units as small as 5x5 and as large as 10x40. And with both indoor or interior access storage units and exterior access drive-up storage units, you can choose the type of storage unit that's most convenient for you. Anyone storing temperature-sensitive belongings will be glad to know we offer climate-controlled storage units that stay between 55°F and 85°F at all times. These units range in size from 5x5 to 10x10. Our Millersville storage facility has drive-up access storage units ranging in size from 10x10 to 10x40. Drive-up units are great for large storage needs because they allow you to pull your vehicle directly up to the unit. In fact, if you need safe storage space for a car or motorcycle, you can even pull your vehicle into the unit. In addition to providing clean, secure storage space in Millersville, the friendly and professional team at Extra Space Storage will go above and beyond to make sure you have an incredible all-around experience. We genuinely care that you get the storage space you need and are happy with your service. The store manager was very helpful in getting me set up and explaining everything. He was courteous and kind. The grounds look fairly well kept and I have easy access to my items. The employee that assisted me in renting the unit was knowledgeable, helpful and friendly. He walked me to the unit so I would know the location . He took the time to demonstrate how to unlock the gate at the keypad. He explained all the major points of the rental agreement. The facility was clean and orderly. The employees or very helpful and courteous. My wife and I are very happy with our experience at Extra Space Storage. Extra Space Storage has met all my needs in a limited time frame. I reserved, met and moved my things in within 24 hrs. I am very pleased. Every item of concern I had was reviewed an explained leaving me completely comfortable with my choice. The staff was great and very helpful. I was in and out, and great prices. I just wanted to say how nice it was that the Manager of the facility stayed late to help me get a storage until on a Monday, just after I moved to MD on a Sunday. I would recommend this facility to all my friends in need of a storage place! This Facility Very Clean, Secure and well lit. It is very easy to maneuver around with wide enough aisles for vehicles to get by even when crowded. The best feature by far is the staff. I've come in contact with two of them on almost a daily basis, Phil and Gabe. I am in and out of there sometimes several times a day and they are both always professional, friendly and accommodating. We've gotten a lot of snow this year and although the lot is completely plowed almost immediately, the plow naturally makes for build up just in front of the doors, I don't know if it's in the job description, but these two guys go out with snow shovels and clear the snow that is still there! Yesterday I called to see if the lot was plowed yet even though it was still snowing, because I needed to go there....when I arrived 15 minutes later they had already cleared the path to my unit! Knowing I was on the way! Great service! Also Phil, the manager, seems to NEVER be off duty....he has waited for me past office hours when I've run late and has given us a hand long after he is "off duty"....on more than a couple of occasions......Just love this place! A box of my valuables broke and someone was nice enough to help me clean it up. They also worked with me with my bill when I needed help. I'm glad I chose you guys for storage!! The employees have been really helpful and nice to me!! After dealing with another storage facility, I am very pleased with the faculty and especially the convenience. I highly recommend Extra Space to anyone who needs to store their belongings. For the past week I have been greeted by this very busy Assistant who has been the only one at the storage facility all week. She although being extremely busy with her own responsibilities, stops whatever it is she is doing to provide quality customer services. And patiently listened to my problems when I needed to vent. I applaud Extra Space for having her. And Thank her for her professionalism and for caring about ME. The staff here is terrific and they really care about their customers. The property is well maintained and clean. I couldn't have made a better choice!! when i needed to go to a smaller unit,greg;was right there to help me.service was great.price was better,and new unit was just around the corner from our old one. greg even remebered my name the next time i was there.he and his trainiee were very personable and helpful.smile & pleasant fokes.i would recomend to any-one who needs extra space. Love the fact that there are no stairs or elevators to deal with. Also i was able to drive my full sized rental truck right up to the unit without any three point turns. I had just about as good of a moving experience as possible, and my experience with Greg at Extra Space was one of the highlights. He was extremely accommodating on the phone, and left no guesswork for me to worry about, like I did with other storage companies. At the facility, Greg was courteous and helpful, and all my expectations were delivered. Thank you for making a stressful process a seamless one! This is the best place ever. It has nice storage sizes, great prices and offers. They even have a truck you can use for free to move into their units. Other places do not offer that. I can out way cheaper by not hving to rent a U Haul truck. It was so easy to get my account set up and the staff was fantastic. Extra Space Storage is very easy and convenient for my family. We know exactly where our holiday stuff is. We know we can get to it whenever it fits into our schedule. This facility and its premises are always well kept. Staff is always accessible,courteous and efficient. I went to the facility to get some things out of storage and the person working answered the door with a big attitude. Apparently she was eating, so I did understand that she didn't like being disturbed but then I apologized and explained that I just wanted to borrow the dollie to help me move my stuff easier. Her reply was "We don't have one". I knew that was a lie because the other very nice lady who works there had let me use it before. I didn't appreciate the attitude and I really didn't appreciate being lied to. I'll be looking for another facility in the future. The security is excellent. I have not found any storage that can provide better security and customer service. This place has all the needed amenities and they make it very convenient to do everything you need to do from accessing your unit to paying the bill to talking with the management personnel. They are very friendly and helpful. Everybody has a bad day, but I haven't seen it from the lady running this location. Drive south on I-97. Take exit 12 for MD-3 BUS toward Glen Burnie. Continue onto MD-3 BUS N. Take a slight right toward Veterans Hwy and turn right onto Veterans Hwy. Pass Old Mill Rd and our storage facility is immediately on your left. Drive north on Veterans Hwy. Our storage facility is on the right immediately before Wendy’s and Old Mill Rd. Drive west on East West Blvd. Pass Elvaton Park and continue straight. Turn right onto Veterans Hwy. Our storage facility is on the right immediately before Wendy’s and Old Mill Rd. Drive northeast on Quarterfield Rd. Turn right onto Stevenson Rd. Turn left onto New Cut Rd and continue onto MD-3 BUS N. Take a slight right toward Veterans Hwy and turn right onto Veterans Hwy. Pass Old Mill Rd and our storage facility is immediately on your left.